What's hot on the green front? Let SGBC News bring you the latest on the green bandwagon, be it injecting fresh views on the sustainability landscape or engaging the community for a healthier and greener future. SGBC is celebrating its 10th year anniversary, starting with the launch of a dedicated logo that will be used to brand all SGBC events and activities for 2019! The SGBC 10th Year Anniversary Logo is an evolution of the Singapore Green Building Council (SGBC) corporate identity as we celebrate what we have achieved in the past decade and where we are heading to next. SGBC’s corporate name stands proudly beside the visual presentation of the 10-year anniversary with the twin leaves emerging from the well of the “0”, symbolising the Council’s strong and steady growth that germinated from humble beginnings. Coming full circle, the anniversary logo was designed by Singaporean designer Ms. Jaime Tai who created the original SGBC corporate logo in 2009. An art and design student at Central Saint Martins at the time, Ms. Tai has also grown into running her own eponymous studio, specialising in visual communication design and trend forecasting. Look out for a whole plethora of SGBC Anniversary events in the coming months! "I am what I am because of who we all are" - this was one of the key takeaways from Minister Masagos Zulkifli during the annual SGBC Leadership Conversations 2018 thought leadership forum. The Ubuntu philosophy strongly echoes Singapore's emphasis on climate action, all of us must work together to address the challenges brought about by climate change. On 23 April 2018, SGBC organised the first-ever SGBC Green Catalyst Challenge 2018, a educational event themed around the UN SDGs for green building. Involving all five polytechnics in Singapore, student teams are tasked to conceptualise and develop workable green building solutions that are able to address one or more of the UN SDGs, involving the social and economic aspects of green building along with the architectural and design considerations. As a hackathon-inspired format, student teams pitched their proposed solutions to our panel of Mentors, Winners of the SGBC-BCA Sustainability Leadership Awards 2017. As leaders of their respective fields, the Mentors gave all teams plenty of food of thought, helped them to crystalise their ideas as well as inspired them to further develop their solutions. The Mentors will work with the student teams to refine their proposals before the Final Pitch event in July 2018. Bukit View Secondary School (BVSS) students can look forward to having lessons in a green classroom fitted out with environmentally-preferred green building materials and eco-features. As BVSS is an advocate for sustainability education and environmental stewardship, the JOULES Smart Centre is intended to bolster their four-year JOULES enrichment programme in order to better educate their students on key environmental issues and developments. Constructed with sustainability in mind, the JOULES Smart Centre was of the brainchild of SGBC’s Green Schools Initiative (GSI) educational outreach programme. These SGBC Green-certified professional services and products have helped the Centre to be energy efficient while creating a healthier indoor environment for the students. Fitted out with a wide range of certified green building products ranging from paint to the flooring, the facility also makes use of proven green building design features to overcome building issues. For example, using a combination of ceiling fans with air-conditioning set to higher temperatures can maintain comfort while reducing electricity consumption at the same time. An indoor green wall located at the front of the room improves indoor air quality and reduces noise levels by absorbing acoustic energy, giving students a healthy, positive place for learning. Apart from these, fittings and furniture provide for a conducive and attractive learning facility. The JOULES Smart Centre will be used for BVSS’ special curricular classes, as well as other school events and functions. Furthermore, plans are in the pipeline to enable community usage of the JOULES Smart Centre. SGBC is also looking into developing a case study using the JOULES Smart Centre as a benchmark to make the case for greener, healthier classrooms. The Building and Construction Authority (BCA), the China Green Building Council (ChinaGBC) and the Singapore Green Building Council (SGBC) signed a memorandum of understanding on 21 March 2017 in Beijing during the 10th Plenary Session of the China Green Construction Committee. SGBC is pleased to announce the appointment of Ms Joelle Chen as the World Green Building Council’s Asia Pacific Regional Network Manager. Her appointment is made possible with the support of Founding Regional Partners AGC Asia Pacific Pte Ltd and LG Electronics. She will be based in Singapore and will operate out of SGBC’s office premises. An architect by training with a wealth of industry knowledge and expertise gleaned from her previous roles at both private firms and the Economic Development Board (EDB), Joelle will work with Asia Pacific GBCs from 15 countries to develop programmes and meaningful cross-sector collaborations. She will be focusing on strengthening the green building business case for investors; reinforcing the role that health, wellbeing and productivity plays in green buildings; and sharing best practices through the WorldGBC’s Asia Pacific Leadership in Green Building Awards, among other initiatives. The Asia Pacific Regional Network Manager serves as the nexus between regional green building organisations, at the same time providing a direct link to the WorldGBC. SGBC is delighted to have the opportunity to further strengthen our connections with regional GBCs and provide members with greater insights and outreach into the greater green building marketplace beyond Singapore. If you would like to have a discussion on regional projects and initiatives, you can contact the SGBC Secretariat at enquiry@sgbc.sg or 67325518. Comprising Green Building Councils from 15 countries, the Asia Pacific Network drives the development of green building across the region. Member GBCs tap on the network and collective expertise to develop regional initiatives and key green building programmes. The winners of the inaugural SGBC-BCA Sustainability Leadership Awards 2016 were announced tonight, before a crowd of local and foreign professionals from the built environment sector. Jointly conferred by the Singapore Green Building Council (SGBC) and the Building and Construction Authority (BCA), the Awards recognises buildings and businesses for being green and sustainable in an innovative way. Announced during the SGBC Gala Dinner 2016 at the Pan Pacific Singapore, these Awards aim to be among Singapore’s leading accolades that recognise and celebrate professionals and their work in the Jointly conferred. The winners for two award categories (Business Leadership in Sustainability and Leadership in Sustainable Design and Performance) will go on to represent Singapore in the World Green Building Council (WorldGBC) Asia Pacific Leadership in Green Buildings Awards 2016, which will be held in India on 5 October 2016. Mr Tai Lee Siang, Honorary Advisor on the board of the Singapore Green Building Council (SGBC), has been appointed Chair of the World Green Building Council’s (WorldGBC) Board of Directors – an influential group of global leaders on green building and sustainability in the building and construction industry. Mr Tai, a past president of the SGBC, was appointed Chair of the Board for his leadership in the green building movement and dedication to improving the sustainability of buildings, both in Singapore and at the global level. He is the first Asian Chair of the WorldGBC Board since its formation in 2002. As SGBC’s second president from 2011 to 2013, Mr Tai established SGBC’s Singapore Green Building Services (SGBS) certification scheme and formed strategic partnerships for the Singapore Green Building Product (SGBP) labelling scheme. These schemes have grown tremendously over the years and have helped the industry to make greener, more informed decisions regarding building design and material selection for buildings. As a prominent figure in the local green building circuit, Mr Tai also actively contributes to many green building conversations through his speaking engagements. Mr Tai takes over the role of Chair as the term of Mr Bruce Kerswill, the previous Chair, comes to an end. The WorldGBC Board of Directors is comprised of senior leaders from 15 Green Building Councils around the world, including India, Australia, Colombia, USA and Jordan. The Board guides the strategy of the WorldGBC and ensures that it successfully delivers on its mission. With one hundred thousand buildings and almost one billion square metres of green building space registered globally, WorldGBC works with member councils such as SGBC and other organisations to ensure that green buildings are key facets of any comprehensive sustainability strategy. Global experts will discuss the role of green buildings in reducing carbon emissions at a three-day conference that kicks off in Seoul on Thursday, officials said Sunday. Hosted by the World Green Building Council, the conference brings representatives from the Asia-Pacific region together to seek ways to promote the use of environmentally friendly buildings after a landmark agreement reached in Paris late last year. Global leaders urged the building sector to devise ways to cut down carbon emissions on the sidelines of the United Nations Climate Change Conference. As parts of efforts to reach the goal, participants of the upcoming conference are expected to discuss various roles of the building sector, which takes up one-third of global carbon emissions. They will also talk about how to adopt zero-energy building systems and reduce the use of fossil energy, organizers said. “The conference will be a venue for governments, businesses and academics in the Asia-Pacific regions to find more practical ways for the building sector to reduce carbon emissions,” Kim Eun-sun, a spokesperson at the Korea Green Building Council, told The Korea Herald. KGBC is the Korean arm of the WGBC. European Union Ambassador to Korea Gerhard Sabathil is scheduled to deliver a keynote speech titled “The role of green buildings in EU climate change policy.” He will share the EU’s strategies and performances in response to climate change, they added. Korean experts, in particular, will present ideas to curb greenhouse gases emitted from existing buildings in Seoul, which accounts for two-thirds of carbon emissions of the capital city, they added. At the Paris Climate Conference, the Korean government vowed to cut emissions by 37 percent from the expected business-as-usual level by 2030. The WGBC’s vice chairman Tai Lee Siang will also speak about the current trends in green building sector in the Asia-Pacific region and will propose some ideas applicable to the Korea industry. Yaki Wo, a specialist from nonprofit organization Architecture 2030, who has stressed the need to reduce carbon emissions in the building sector since the early 2000s, will share some issues about green building certifications. Last year, the BCA Green Mark Scheme has reached an important milestone as it marks a decade of sustainability. In the recent release of the Global Sustainable Buildings Index, Singapore has fared well in terms of green building certifications, incentives, and policies. To date, BCA has greened more than 30% of Singapore’s building stock. A Photo Story has been created to update key green initiatives championed by BCA in spurring the green building movement, together with various stakeholders. Green buildings enjoy increase in asset value and greater energy savings. BCA, alongside with industry’s stakeholders, have been playing an active role in pushing the boundaries of sustainability. This has transformed Singapore into an internationally recognised Green Building Hub with established green capabilities. Click here to view the full Photo Story. For more information on the BCA Green Mark Scheme, please click here. The Singapore Green Building Council (SGBC) is pleased to announce that the Singapore Green Building Product (SGBP) label is now supported under SPRING Singapore’s Capability Development Grant (CDG) financial assistance programme. With this CDG support, qualifying SMEs can look forward to adopting international and industry benchmarks to develop capabilities, improve processes, sharpen their competitive edge as well as access new markets. The CDG will defray 70 percent for both the costs of SGBP certification (for up to two products) as well as for ISO 14001:2015 certification, capped at $30,000. Adding greater value to certification of building products, recognition for certified products has been enhanced and has been made more comprehensive in the latest version of the Green Mark Scheme, Singapore’s national rating tool for green buildings administered by the Building and Construction Authority (BCA). In Green Mark 2015, higher-rated SGBP certified products are also able to accrue higher scores for building projects, giving the industry more impetus to specify SGBP-certified products for use. With the CDG’s support, SMEs can now work towards the industry-recognised SGBP certification without being deterred by the costs involved. On ChannelNewAsia's Firstlook Asia’s episode on environmental series, Mr Tai Lee Siang, Vice Chair of the Board of the World Green Building Council and Honorary Advisor for the Singapore Green Building Council, was interviewed for his insights on Sustainable Cities. New global report finds that Singapore is an important, growing market for green building products and services. The first major report to be released under WorldGBC's Better Places for People campaign was launched on 2 February 2016 in London. The report, Health, Wellbeing and Productivity in Retail: The Impact of Green Buildings on People and Profit, finds that retailers can improve the shopping experience for their customers and potentially increase their profits by providing greener, healthier stores. This report breaks new ground by presenting ways in which retailers can begin to measure the impact of place on profit using data which may already be available at their fingertips. An energy performance contract (EPC) can guarantee energy savings for an existing building without an initial financial outlay. To help building owners overcome the initial financial barrier to retrofit their buildings, the Singapore Green Building Council (SGBC) has collaborated with the Building and Construction Authority (BCA) to develop a standard EPC template for building owners and EPC firms to use. The EPC template was developed in consultation with several established EPC firms and building owners. The standard template assists in accelerating the retrofitting process by clearly spelling out the key conditions of contract for both the building owner and the EPC firm so that building owners can better focus on the critical component in any EPC: the amount of energy savings guaranteed. The EPC template complements the Building Retrofit Energy Efficiency Financing (BREEF) scheme by BCA which offers financing to building owners, Management Corporation Strata Titles (MCSTs), Special Purpose Vehicles and EPC firms for energy efficiency retrofits. In an EPC, the EPC firm will guarantee specific energy savings for the building over a set period of time, either in monetary terms or a savings percentage. The EPC firm can either provide financing to undertake all the necessary works to complete the retrofit of the building, or the building owner can finance the retrofit. For the first option, the building owner will not need to incur an initial financial outlay to start saving energy. In both cases, the cost of these works will be offset by the energy savings as a result of the retrofitting. “With this standard template, building owners can ease into building retrofit projects, allowing their buildings to become more energy efficient, with a healthier environment for their occupants. Having in place an EPC will also allow building owners to focus on other aspects of the building, knowing that the building’s energy efficiency and performance is in the hands of professionals,” said Mr Chia Ngiang Hong, President of SGBC. As buildings present a tremendous opportunity to reduce emissions and mitigate the effects of climate change, this new EPC template is part of SGBC’s commitments made during Buildings Day at COP21 in Paris on 3 December 2015 to drive change and market transformation for green buildings. “As Singapore remains committed to reduce its emissions through its Intended Nationally Determined Contributions, retrofitting existing buildings through an energy performance contract can lower the carbon emissions intensity of buildings and create a more sustainable and greener built environment,” Mr Chia added. In the latest BCA Building Energy Benchmarking Report 2015, a study on 83 existing buildings which are certified to have met the Green Mark Gold rating or higher, showed that retrofitting existing buildings can save up to $41 million annually. “There is a strong business case to retrofit energy inefficient buildings. The EPC provides a market solution to help building owners achieve energy savings and it has been gaining popularity over the years. It is now timely to launch the standard template contract, putting together the best practices. We hope that this will inspire confidence in building owners to make the decision to embark on energy-saving initiatives,” said Dr John Keung, CEO of BCA. Sim Lim Tower, Ngee Ann City and Treetops Executive Residences are proof of older buildings that have gleaned tremendous benefit from EPCs. 36-year old Sim Lim Tower has achieved 41 percent savings in electricity bills (excluding tenants) with average monthly energy savings of approximately 86,000 kWh since the retrofits were completed in March 2015 under an EPC arrangement. Treetops Executive Residences, a 16-year old residential building, has reaped energy savings of 52 percent after its retrofit. The standard template EPC will be available for purchase from SGBC in early 2016. EPC firms certified under SGBC’s Singapore Green Building Services (SGBS) labelling scheme will also use this contract in their EPC projects. To read the full media release jointly issued by SGBC and BCA, click here. To see the list of SGBS-certified EPC firms, click here. The Building and Construction Authority is representing Singapore in the Global Alliance for Buildings and Construction which was launched at the inaugural ‘Buildings Day’ at the United Nations climate change summit in Paris. The Alliance involves the participation of governments, major building and construction stakeholders and potential funders, to help the buildings and construction sector achieve the climate goals and common objective of limiting global warming to below 2°C. According to the United Nations Environment Programme (UNEP), the buildings and construction sector is responsible for 30% of global CO2 emissions. This figure is growing rapidly and could reach 50% of CO2 emissions by 2050. This rise in emissions will increase the risks and vulnerability of countries, regions and local communities to the impacts of climate change. Limiting global warming to below 2°C requires reducing the building sector’s energy consumption by at least 30% through means of mainstreaming highly energyefficient new buildings and a deep renovation of the existing stock of buildings by 2050, said the International Energy Agency (IEA). The Alliance will facilitate the mobilisation of international resources for efficient local operational solutions, align existing initiatives, commitments and programmes to achieve greater scale, and catalyse greater pace and impact of climate action in the buildings and construction sector. Initiating partners and members of the Alliance including BCA, will participate through regular engagements and sharing sessions, making climate actions visible and reporting on their progress, developing common and appropriate climate goals and promoting transparent measurement protocols. They will also lead or contribute to key climate change mitigation opportunities through initiatives such as net zero energy buildings, sustainable housing and tropical architecture solutions. the financing options available to accelerate investment and funding for greenhouse gas mitigation projects and programmes for the building and construction sector. “The activities of the Alliance have potential synergy with our collaboration with the UNEP in the BCA Centre for Sustainable Buildings (CSB) and the Nationally Appropriate Mitigation Action (NAMA) Development for the Building Sector in Asia. Our annual International Green Building Conference (IGBC) also attracts a wide audience and can serve to enhance communication and facilitate greater action to reduce the building sector’s impact through this global platform. As a part of a worldwide alliance among key stakeholders in the building sector, we will leverage on existing BCA initiatives to contribute towards the “below 2°C path” and facilitate the objectives of this Alliance,” said Dr John Keung, CEO of BCA. The BCA CSB has been promoting sustainability in the building sector in Southeast Asia through identification of successful policies, strategies and technologies at the regional and national levels. It is also working with UNEP through the NAMA project to support countries in Asia to develop national plans and frameworks to reduce greenhouse gas emissions in their building sectors. Mr Ang Kian Seng, BCA’s Group Director of Technology Development represented BCA Singapore in the formal launch of the Alliance and participated in the panel discussion on Government Leadership in Policy and Strategies at the Buildings Day, where he shared Singapore’s experience and approach towards green building development. In support of the COP21, the World Green Green Building Council and green building councils worldwide, including the Singapore Green Building Council (SGBC), have also embarked on a new campaign: #BetterBuildGreen. The campaign highlights the key role of green buildings in reducing emissions and their economic and social benefits. SGBC has pledged a number of commitments to drive this initiative and change. The Singapore Green Building Council (SGBC) has pledged robust commitments to drive change and market transformation for green building at COP21 in Paris today. Broadly, SGBC will continue to work with both the public and private sectors to support the goals of Singapore’s Intended Nationally Determined Contributions (INDC) to reduce emissions intensity by 36% from 2005 levels by 2030, to continually promote green building design, practices and technology as well as to enhance current certification schemes to remain relevant to a dynamic marketplace. The commitments were made at Buildings Day - the official COP21 meeting led by Mrs Ségolène Royal, the French Minister of Ecology and former presidential candidate. The Global Alliance for Buildings and Construction, aimed to scale up the implementation of ambitious sustainable actions, was also launched on this day, and the World Green Building Council along with all 74 member green building councils and their 12,000 member companies will be part of this new Alliance. All 74 national green building councils support the high level commitment from the World Green Building Council to achieve Net Zero carbon for new buildings and energy efficient refurbishment of the existing building stock by 2050. A total of 25 green building councils, including Singapore, also unveiled national commitments to register, renovate or certify over 1.25 billion square metres of green building space - almost twice the size of Singapore - and train over 127,000 qualified green building professionals over the next five years. Buildings currently account for around one third of global emissions, but green building is one of the most cost-effective solutions to climate change, which generates significant environmental, economic and societal benefits. Green buildings have been proven to improve people’s health, wellbeing and productivity – for example, improved indoor air quality can lead to productivity improvements of up to 11 per cent. To read more on Singapore's commitments, click here. SGBC is greatly saddened to hear of Mr Kwek Leng Joo’s passing. Mr Kwek and CDL were instrumental in the establishment of the Singapore Green Building Council in 2009, keenly supporting the Council’s activities and initiatives in advancing the green building agenda over the years. A visionary in advocating environmental conservation and sustainable practices, Mr Kwek had also tirelessly led CDL’s green journey since 1995, when CDL first embarked on its “Conserve as it Constructs” approach towards property development and management. Since then, CDL has set innumerable benchmarks for green building and resource conservation. For his enduring onus on sustainability, Mr Kwek was bestowed the first Green Visionary Award in this year’s BCA-SGBC Green Building Individual Awards, a testament to his passion, dedication and leadership in the industry. CDL also emerged as the first ever Winner for the World Green Building Council Asia Pacific Awards for Business Leadership in Sustainability in 2014. SGBC Members and staff offer our deepest condolences to Mr Kwek’s family for their loss, and our thoughts remain with them during this difficult time. Green Building Certification and Market Transformation Green building certification is a core driver for building and operating better and greener buildings all around the world. Through the use of a green building rating tool property developers, owners and operators are able to push the boundaries above and beyond building regulations and be rewarded for doing so. Whilst regulations ensure that a responsible minimum standard is set for the mass market, green building rating tools pull the market towards even higher environmental performance, rewarding the choices and leadership within the built environment that contribute to holistic environmental performance. Green building rating tools form a tiered based performance indicators or standards that are contextualised to the local social cultural and environmental situation in which that rating tool has been developed for. Green building rating tools, unlike regulations alone, form a common ground for entire project teams to work towards, they engage building owners, users, consultants, tradesmen, and the wider population into the discourse and the green building movement. As New Climate Economy launches its report on Raising Energy Efficiency Standards to the Global Best, calling for greater synchronisation of standards in the future, WorldGBC demonstrates how its network of over 75 GBCs are implementing global best certification - today. Green building rating tools can be purely voluntary, such as Green Star in Australia which is successful in enabling responsible developers and building owners to shine and demonstrate their environmental credentials. National landmarks like the Sydney opera house have understood the value of certification and have been achieved Green Star Performance (their existing building rating tool) certification. Rating tools can also be used as a top down approach, like Green Mark in Singapore. Here the green building rating tool is used to set minimum environmental legislation for both new and existing buildings, whilst higher awards are mandated in key growth areas and public sector led developments. Rating tools can also provide tools for government incentives to pull the industry to further embrace the lifecycle benefits of sustainability. WorldGBC, GBCs and Rating Tools Green Building Councils, members of the WorldGBC network, administer and develop the majority of the world’s ratings tools. GBC Australia and GBC South Africa administer Green Star; Singapore GBC works closely with the Singapore Building and Construction Authority’s on Green Mark; USGBC develops and administers LEED in partnership with many other GBCs; India GBC a full range of proprietary rating tools they developed closely with industry and government; and many more. By 2014, our Green Building Councils had rated over 1.2 billion square metres of green building area all over the world, and many GBCs are committing to certification targets over the next 5-10 years as part of WorldGBC’s COP21 Better Build Green campaign. Quality Assurance and The WorldGBC Quality Assurance Guide With the widespread use of rating tools globally, we believe there must be quality standards to ensure that the green building rating tool used is robust and positively contributes to environmental sustainability. Therefore, WorldGBC has launched the Quality Assurance Guide for Green Building Rating Tools to guide new, emerging and established rating tools to ensure that their development and implementation is robust, transparent and to a good standard. The QA guide contains development and operational models to steer rating tools towards common good principles of certification. The WorldGBC through its global network will continue to work to promote and develop frameworks, resources and guidance standards that facilitate better, greener, healthier and happier buildings for all to enjoy. Click here for the Quality Assurance Guide. Better Build Green is the World Green Building Council’s new campaign which focuses on the UN climate change negotiations - COP21 in Paris. The campaign aims to show the world that green buildings offer one of the best and most cost-effective ways to tackle climate change and help keep global temperature rises within the two degrees limit. The campaign will highlight green buildings’ key role in reducing emissions and creating economic and societal benefits. It will also draw attention to Buildings Day - the first ever day dedicated to the building sector and its contribution to tackling climate change at COP, led by France, UNEP, WorldGBC and other partners. The campaign will also highlight WorldGBC’s global collective commitment for COP21 and national commitments from Green Building Councils - which will be unveiled at Buildings Day. Click here to find out about SGBC's commitments and how you can be involved in #BetterBuildGreen. Click here to go to the Build Better Green website. It is aimed at: • Helping to place job-seeking PMEs into suitable SME job roles • Assisting SMEs to recruit, train, manage and retain newly-hired PMEs • Promoting progressive human resource practices within SME ecosystem For more information, please click here. The English telecast has premiered on Tuesday, 6 October 2015, 8.30pm on Channel NewsAsia, while the Mandarin telecast was broadcast on Channel 8 on Sunday, 11 October 2015, 10.30pm. To watch episode 1 online, kindly click on the following image. The 7th Singapore Green Building Week has drawn to a successful close! As one of the largest green building events in the region, Singapore hosts the Singapore Green Building Week each year to resounding success, and the 7th edition, held from 1 – 4 September 2015, was no different. Playing host to hundreds of foreign delegates from every segment of the construction value chain, SGBW 2015 will remain on visitors’ minds for a long time. Green Mark 2015 was officially launched for piloting on 2 September 2015, and it will play a more prominent role in driving and communicating sustainability outcomes. The scheme has been restructured to encompass four main sections: Climatic Responsive Design, Building Energy Performance, Resource Stewardship as well as Smart & Healthy Building. In addition, a bonus section on Advanced Green Building Efforts has been added to recognise sustainability efforts that go beyond assessment requirements. Through SGBC’s consultative sessions with the Building and Construction Authority (BCA) on Green Mark 2015, SGBC has been seeking greater recognition for products and services certified by SGBC’s labelling schemes. These feedback culminated in certain sections of the criteria that give added focus to certified products and services. Click here to read more about the enhanced recognition in Green Mark Ver. 2015. To download the Introduction Slides to Green Mark Ver. 2015, click here. Asia’s Leading Green design and Green projects competitions are back! The 2016 FuturArc Prize (Launched in 2008) is the first International Green Building Design competition in Asia open to professionals and students. The 2016 FuturArc Green Leadership Award (Launched in 2009) recognises the team behind a completed project: the developer, consultants and contractors, who have collectively pushed the limits and definition of What a Green building is in Asia Pacific. For more details of both competitions, please click here: FuturArc Prize & FuturArc Green Leadership Award 2016. Unveiled at SGBC’s 6th Anniversary Dinner with Mr Quek See Tiat, Chairman, Building and Construction Authority (BCA) bearing witness, the SG Green magazine focuses on the practical and technical applications of green building materials and products certified by SGBC’s Singapore Green Building Product (SGBP) and Singapore Green Building Services (SGBS) labelling schemes. For more details, please see the PDF. SGBC, together with World Green Building Council, is pleased to be partnering with Dodge Data & Analytics (formerly McGraw Hill Construction) on an update to the World Green Building Trends SmartMarket Report (SMR). The World Green Building Trends survey will offer key insights on construction activity around the world by examining important trends affecting and transforming the construction industry on a global, regional and national level. Most critically, the survey will provide information on the benefits experienced in green construction globally and the variation of green practices and standards by region. By participating, Singapore industry will be able to inform the global building community about the Singapore’s green building market. To participate in the survey, please go to: Here. The results of the survey will be disseminated worldwide to professionals in over 90 countries. The results will also be used to produce a new, updated World Green Building Trends SmartMarket Report (SMR), an update and expansion of the 2013 report. This study was ground breaking in its reach because of the participation of GBC members globally, and garnered widespread global attention. SGBC is pleased to partner the 2015 GRESB Survey and members are encouraged to participate in the survey. The Global Real Estate Sustainability Benchmark (GRESB) assesses the sustainability performance of real estate portfolios around the globe. Participating in the survey provides respondents with the opportunity to measure their sustainability performance, benchmark the organization against industry peers, and identify areas for improvement. The GRESB survey provides a useful platform for the real estate sector to report portfolio-level sustainability achievements to the investment community. The survey closes on 1 July 2015 and registration can be made via www.gresb.com. The annual BCA Awards was held on the 14 May 2015, where 372 companies received their well-deserved recognitions for construction excellence, design and engineering safety, construction productivity and green buildings. A number of SGBC members were recognised for their contribution towards a greener built environment.City Developments Limited (CDL) in particular, won the inaugural BCA Green Mark Pearl Prestige Award for their existing Green Mark Platinum City House in the Central Business District. The building has exemplary total building performance, with 70% of its interior office space also greened to Green Mark Office Interiors standards. Mapletree Investments Pte Ltd also joined the coveted ranks of Green Mark Champion, standing proud with only eight other Champions as a selected group of organisations with complete understanding of business and environmental sustainability, demonstrated as well by a commitment towards high performance buildings. Mapletree is the sole recipient of the Green Mark Champion accolade this year, which is given to developers who have a substantial number buildings certified to at least Green Mark Gold level. SGBC would like to congratulate all members who have been recognised for their efforts in greening the built environment in Singapore and beyond. For more details, please refer to the PDF. Demonstrating by example, the Singapore Green Building Council's office premises have been certified Platinum, the highest possible rating for the Green Mark Scheme administered by the Building and Construction Authority (BCA). Read more to find out the solutions implemented to achieve the rating: PDF. A staple in many neighbourhoods in Singapore, the humble playground have to upgrade itself to be safer, sturdier and more fun for children. The Unity Collection playground system by Playworld is first of its kind to be certified under the Singapore Green Building Product (SGBP) Certification Scheme. But what more can be done? For more details, please see the PDF. To recognise outstanding industry practitioners and professionals for their consistent contribution and significant achievements in the development of a green and sustainable built environment, the Building and Construction Authority (BCA) and the Singapore Green Building Council (SGBC) have launched a joint BCA-SGBC Green Building Individual Awards since 2011. The BCA-SGBC Green Building Individual Awards accord recognition to like-minded individuals, from across the building and construction value chain, for their consistent contribution and outstanding achievements in this challenging yet fulfilling journey towards greater environmental sustainability in the built environment. This initiative will go a long way in raising the profile and ensuring the retention of capable professionals and practitioners in the industry. The closing date of submission is extended to 15 May 2015. Interested parties are to submit the Nomination Documents (in soft copy and/or CD-rom) directly to BCA by 12 noon on 15 May 2015 (Fri). The World Green Building Council (WorldGBC) has announced the appointment of Terri Wills as its new Chief Executive Officer. More industry-relevant initiatives and programmes are in the pipeline, pledged Mr. Chia Ngiang Hong (Group General Manager, City Developments Limited) as he took over the reins of leadership for the Singapore Green Building Council (SGBC) from Er. Ng Eng Kiong (Managing Director, Squire Mech Pte Ltd). Announced during SGBC’s Annual General Meeting on 23 March 2015, the newly-minted SGBC Board (2015/17) led by Mr. Chia as the President was formally introduced to about 100 SGBC corporate members and representatives from Singapore’s building and construction industry. Comprising a good mix of individuals from each crucial pillar of the construction sector value chain, the new Board is well-poised to accelerate the awareness and adoption of green building practices. To see the full media release, please refer to the PDF. Held in the ballroom of Grand Copthorne Waterfront Hotel, SGBC members received a report of the activities and initiatives accomplished for year 2014, with the respective office bearers from the SGBC Board sharing key highlights of specific SGBC programmes. For more details, please see the PDF. We are pleased to inform you that nominations are now open for the Green Building Individual Awards 2015, jointly awarded by the Building and Construction Authority (BCA) and SGBC. SGBC and BCA would like to invite both local and international professionals and individuals who have contributed significantly to the development and management of green and sustainable buildings in Singapore and/or Green Mark projects overseas to participate in the Green Building Individual Awards. The Awards will be presented at a ceremony during the Singapore Green Building Week in September 2015. • an ‘Expression of Interest’ form first, prior to proceeding with the submission of nomination forms. For more details on the Awards, please see the PDF or visit the BCA website at link. Singapore Green Building Council’s product certification scheme helps the building industry raise its sustainability standards and creates new business opportunities for its members. To read more, including an example of how a SGBC member benefitted from the membership and SGBP certification, please refer to the PDF. Please refer to the link. As part of an interconnected ecosystem, research, technology and financing all play critical roles in any green building initiative. Individually important but more potent if applied in unison, companies onboard the green building bandwagon must be able to achieve synergy among these three pillars in order to full reap the benefits uncovered by research, executed with technology while being adequately financed for maximum efficiency. For more details, please see the PDF. With effect from 23 September 2014, Mr Tan Swee Yiow of Keppel Land Limited will be appointed as Treasurer of SGBC Board and Mr Ler Seng Ann of the Urban Redevelopment Authority will assume the position of Assistant Treasurer. Mr Tan Siong Leng, who has served as Treasurer on the SGBC Board from the start of the Board’s current term since March 2013, has retired from service at the Urban Redevelopment Authority. During his term as Treasurer, Mr Tan’s vast experience and knowledge of the industry had been instrumental in elevating the profile of SGBC and generating greater awareness of SGBC’s initiatives. The Urban Redevelopment Authority (URA) has appointed Mr Ler Seng Ann as URA’s Official Representative to the Council. The SGBC Board and Secretariat would like to thank Mr Tan Siong Leng for his significant contributions to SGBC and welcome Mr Ler Seng Ann to the Board. Held in the Pod of the National Library Board building on the evening of 16 September 2014, the Singapore Green Building Council (SGBC) and carpet tile designer and manufacturer Interface organised a cosy networking session for members and associates. The evening’s guest speakers – Ms Erin Meezan, VP of Sustainability from Interface and Ms Jamie Dwyer, Biologist and Design Strategist – took participants through an abridged journey of Biomimicry, sharing interesting information about the applications of natural principles in human designs. For more details, please see the PDF. 1 Sep - Companies who specialise in services such as architecture, quantity surveying, and energy performance contracting can access global opportunities with the Green Services Certification endorsement from the Singapore Green Building Council. To continue reading the Eco-Business article on SGBS Certification, click Here. For more information on SGBS Certification, click Here or email us at to=certification@sgbc.sg" target="_blank" style="color: rgb(60, 159, 0); text-decoration: none;">certification@sgbc.sg. In its sixth year, the annual Singapore Green Building Week 2014 (SGBW 2014) played host to international green building advocates, experts, policy makers, academicians and industry professionals. SGBW 2014 provided a valuable platform for a diverse green building community from over 20 countries to share knowledge, ideas and suggestions for a greener planet and built environment. The activities for the Week included the International Green Building Conference, BEX Asia exhibition, Design Green!, World Green Building Council Asia Pacific Network Forum 2014 and SGBC Anniversary Dinner. Local firms City Developments Limited (CDL) and Keppel Land Limited are the inaugural Winners for the Business Leadership in Sustainability category in the first ever World Green Building Council Asia Pacific Regional Network Leadership Awards in Green Building. From a pool of seven Finalists made up of green building champions across the Asia Pacific region, CDL and Keppel Land received their trophies alongside fellow category Winner ITC Limited (India) from the evening’s Guest-Of-Honour Dr Vivian Balakrishnan, Minister for the Environment and Water Resources. The Presentation Ceremony, which was held during the Singapore Green Building Council’s (SGBC) 5th Anniversary Dinner, also honoured New Zealand early childhood centre Te Mirumiru as the Winner for the Leadership in Sustainable Design & Performance category. Out of the seven Finalists for the Business Leadership category, three are SGBC Member companies. In addition, two out of eight projects in the Design & Performance category are Singaporean buildings, a testament to the high quality and standards of Singapore green buildings. More information about the APN leadership award winners can be found Here. To read the SGBC President Mr Ng Eng Kiong's speech for SGBC Anniversary Dinner 2014, click Here. Members of the Singapore Green Building Council (SGBC) have been named as Finalists in the World Green Building Council’s (WorldGBC’s) inaugural Asia Pacific Regional Network Leadership Awards in Green Building. More information about the APN leadership awards can be found Here. More information about the APN Awards and the EDB Roundtable can be found Here. In any built environment, existing buildings no doubt make up the bulk of the landscape. Many of these were constructed before the global green building movement gained traction, built with methods and materials that were less-than-green, going by modern standards. Therefore, greening existing buildings is a major undertaking Singapore has embarked on since 2012, when the Building Control Act legislating the greening of existing buildings was passed. For more details, please see the PDF. The Singapore Green Building Council (SGBC) is supporting the annual Singapore Sustainability Directory 2014 published by the Singapore Business Federation (SBF). The Directory serves as Singapore’s top publication for the sustainable business community - connecting buyers and sellers. It is supported by key government agencies such as Economic Development Board Singapore (EDB), International Enterprise (IE) Singapore, SPRING Singapore, National Environment Agency (NEA) and Public Utilities Board (PUB). In the Directory, SGBC will have a special section featuring SGBC Members and/or their Certified Products/Services. MultiNine Corporation, the Directory coordinator appointed by SBF, will be sending out emails to SGBC Member Companies to see if companies would like to be featured more prominently within the Directory. More information about the Directory can be found Here. 23 Jul - While it is unusual for any government to be involved in setting up NGOs (non-government organizations), this did not deter Singapore’s building authority in helping to create the city-state’s first industry-led organization to champion green building awareness some five years ago. Never did they imagine that the fledgling Singapore Green Building Council would grow and evolve to become a powerful green building advocate that would put Singapore on the global map. The afternoon event started off with President of SGBC, Mr Ng Eng Kiong and Chargé d’Affaires and Commercial Counsellor of the Austrian Embassy in Singapore, Mr Volker R. Ammann, providing their insights on developments in the industry and Singapore. For more details, please see the PDF. Twelve outstanding individuals in the built environment sector will receive the prestigious BCA-SGBC Green Building Individual Awards at the annual BCA Awards 2014 held at Resorts World Sentosa on 22 May 2014. The BCA-SGBC Green Building Individual Award accords recognition to individuals from across the building and construction value chain for their consistent contribution and outstanding achievements in driving sustainability in the built environment. In line with the national push towards effective and efficient management of green buildings, a new category – Green Facilities Manager of the Year – was introduced this year to recognise facility management professionals who have shown strong commitment and contribution towards greening and optimising the operation of existing buildings. For an overview of the Award winners, pls read our media release. To get to know our winners, read more about them here. The WorldGBC, of which SGBC is an Established Member, is pleased to be partnering with McGraw Hill Construction on a new study looking at the impact of buildings on the health of their occupants, and we encourage all of our members to participate. Based on survey responses from building and HR professionals, the survey will demonstrate industry awareness and consideration of health issues during project design and construction, the benefits experienced, drivers and obstacles, and the top categories of practices and products used. If you are a building professional (architect, engineer, contractor, building owner/manager), click here to begin the survey. If you are an HR professional, click here to begin the survey. The results of the survey will be used to produce a Health Impacts of Buildings SmartMarket Report (SMR), which will be widely distributed to the global design and construction community. In appreciation for your time, those completing the survey will have the option to receive this exciting new report directly sent to you. The survey will take approximately 15 minutes to complete, and participation is only possible through 14 May 2014. Your responses will be completely confidential and used for this survey only. All responses will be analysed in aggregate, and no individual responses will be referenced or used in any way. Aside from the survey, there are 2 upcoming consultation webinars for the WorldGBC Health, Wellbeing and Productivity in Office Buildings project 6 May 2014 (3pm SG Time) and 7 May 2014 (11pm SG Time). The interactive webinar sessions will allow you as SGBC member to give input on this valuable work. We encourage all members to join the webinar on either dates. To register your interest, please visit WorldGBC Project - Webinar. • Lead the next phase of green building movement focusing on higher standards of energy efficiency; indoor environment quality through sustainable building products and technologies; and users’ comfort and productivity. • Engage and collaborate with the key stakeholders from public and private sector, local and regional, to create a sustainable environment that benefits the communities, environmental friendly, and economically rewarding. • Showcase sustained building performance through integrated design, commissioning, maintenance and building operation. The deadline for abstract submission is extended till 9th May 2014. The abstract is required to be submitted via online system here. Please see attached for more information on the IGBC 2014 Call for Presentations. If you have questions about ‘IGBC 2014 Call for Presentations’, you may contact Eddy Susilo at +65 6325 5028 or email bca_igbc@bca.gov.sg. You can find highlight of previous IGBC at Youtube. The i Light Sustainability Workshop is a partner event of the i Light Marina Bay 2014. Themed “HeART of Creative City”, this workshop explored the contribution of the various aspects of lighting to sustainability, including artificial and day‐lighting. For more details, please see the PDF. The inaugural Asia Pacific Regional Network Leadership Awards in Green Building have gained momentum, with an awards partner and two high-profile judges announced. Please refer to the PDF media release. Mr Eugene Seah, SGBC Board Technical Coordinator and Group Managing Director of Langdon & Seah Singapore Pte Ltd, shared with members on changes to SGBC’s Singapore Green Building Product (SGBP) certification scheme and on the partnership with TÜV SÜD PSB on product assessment under the SGBP scheme, which would come into effect on 1 April 2014. The 2 nd presentation was delivered by Mr Mann Young, WorldGBC Asia Pacific Network Manager and Head of CLT Business, Asia of Lend Lease Asia, who shared with members on activities and priorities in the Asia Pacific network of Green Building Councils. For more details, please see the PDF. WorldGBC has launched the inaugural Asia Pacific Regional Leadership Awards in Green Building to provide a platform for your company to promote its achievements, and share industry's best practice green building solutions with the region. - Business Leadership in Sustainability: presented to the corporation which best demonstrates a commitment to sustainability as part of its core business model. The award acknowledges leadership in corporate social responsibility, with emphasis on policies and programs that reduce and reverse the impact of business practices on the environment. - Leadership in Sustainable Design and Performance: recognizes a green building project that demonstrates innovation in achieving minimum impact on the environment and maximum impact on health and productivity. Nominations must be submitted through SGBC and a nomination fee of SGD$139.10 after GST (equivalent to US$100) per nomination/ project is applicable. All nomination fees are payable by cheque addressed to “Singapore Green Building Council”. All nominations must reach SGBC by 6 June 2014. To find out more about the awards and how we can work together to promote your projects and company leadership, you may wish to read the FAQshere or please contact Ms Tham Kai Wai (membership@sgbc.sg). SGBC has been witnessing growing demand and interest in our SGBP Certification Scheme. The Technical Coordination Committee has been working tirelessly in the past few months to revamp current SGBC product classification categories. This work has been completed. The aim of expanding the previous classification categories is to align it against the framework of the Construction Electronic Measurement Standards (CEMS). This ultimately improves the procurement process through the definition of items and work sections that facilitate sourcing of materials for construction projects. The new product categorization will see our current 500 SGBP-certified products housed into 20 work sections. This re-categorization will make it more convenient for practitioners to select green-certified products that correspond to the type of works. In addition, having products classified according to the CEMS framework will lead to a seamless integration of SGBP products into the BIM object libraries, such as the newly launched Singapore Institute of Architect (SIA)’s intelligent internet Design Object Library (iDOL). SGBC’s Technical Coordination Committee will continue to make the necessary changes to the SGBP certification framework to provide more green building products to the construction industry. We are pleased to inform that nominations are now open for the Green Building Individual Awards 2014, jointly awarded by the Building and Construction Authority (BCA) and the Singapore Green Building Council (SGBC). The main objective of the Awards is to accord recognition to individuals from the built environment sector for their consistent contribution and outstanding achievements to sustainable development in Singapore. The Awards comprise of the categories listed below, with the introduction of a new ‘Green Facilities Manager’ award category this year. BCA and SGBC cordially invite professionals and individuals who have contributed immensely in the development and management of green and sustainable buildings to participate in the Green Building Individual Awards. The Awards will be presented at the BCA Awards Night in May 2014. For more details on the Awards, please refer to the PDF or visit BCA website here . SGBC is pleased to announce that the nominations for the annual Green Building Individual Awards are now open. The Awards are organised jointly by SGBC and the Building and Construction Authority (BCA) to accord recognition to individuals in the building and construction sector for their consistent contribution and outstanding achievements in the development of a green and sustainable built environment. The Singapore Green Building Council is pleased to become a founding member of the Global Coalition for Green Schools, which works collectively to shape schools and communities to fundamentally change the way students learn about the world around them. Together with 29 founding members, SGBC is committed to establishing and leading a national network for green schools within each of their respective countries. The goal is to promote shared vision of green schools for all within this generation. Please refer to PDF for full media release. SGBC recently celebrated its 4th Anniversary Dinner at Hibiscus Ballroom at Marina Bay Sands on 12 September 2013. More than 650 SGBC members and guests enjoyed a night of entertainment, dinner and networking. SGBC had the honour of the company of Dr Vivian Balakrishnan, Minister for the Environment and Water Resources, for the evening as our Guest-of-Honour. Please refer to the PDF for more information and picture gallery. Please refer to the PDF for in-depth report. Led by the World Green Building Council, SGBC hosted the regional Green Building Councils (GBCs) at Marina Bay Sands on 11 September. Highlights of the discussions include overview of GBCs’ efforts and the partnership with public and private sectors. Please refer to the PDF for more information. Singapore Green Building Week (SGBW) played host to international green building experts, policy-makers, academics and built environment practitioners, for a congregation of ideas, collaboration and learning to achieve a shared vision of a greener planet through the green building movement. Key highlights of international events that took place during SGBW included International Green Building Conference (IGBC) 2013 and BEX Asia 2013 exhibition. Please refer to the PDF for more information and picture gallery for BEX Asia. The theme for this year was “Unfold the True Value of Green Retrofits”. Speakers shared their knowledge and experience from various aspects of retrofitting buildings for sustainability. For more details, please see the PDF. SGBC is proud to announce that Mr Tai Lee Siang, SGBC's Immediate Past President, has been appointed to the World Green Building Council’s (WorldGBC) Board of Directors, together with four other leaders in the global green building movement. Mr Tai is one of the pioneers of Singapore’s sustainability movement. Under his leadership, SGBC had expanded its focus from the industry to the community and youths in particular. He is a strong believer that the green building movement cannot be complete without the buy-in of the people and the general public. During his term as SGBC President, he had forged many strong ties internationally and he is keen to continue to be the conduit for WorldGBC in Asia and help further strengthen the Asia Pacific Network of GBCs. With the new line-up of WorldGBC Board and now 97 GBCs globally,the World Green Building movement is growing exponentially and SGBC is well-placed to tap on the vast knowledge and expertise in the GBC network. Our heartiest congratulations to Mr Tai! SGBC would also like to take this opportunity to thank Mr Lee Chuan Seng, SGBC's Honorary Advisor and Founding President, for his pioneering efforts in representing SGBC on the Board of the WorldGBC from 2010 to 2013. For more details, please refer to the official WorldGBC press release. This lecture series has provided a platform for industry practitioners to gain insights from international award winning designs and projects on greening of buildings. For more details, please see the PDF. The evening started off with a seminar titled “Design for Life”, with SGBC President Mr Ng Eng Kiong giving the opening speech and presenting Mr Rob Coombs, CEO & President of Interface Asia-Pacific, with SGBC Green Product Certificate for Interface’s Glasbac, GlasbacRe and Cushionbac range of carpets. Interface is the first carpet company to receive green product certification from SGBC and all 3 products were awarded SGBC’s Excellent (3-ticks) certification. For more details, please see the PDF. SGBC members secured more than half the wins at the latest BCA Awards 2013 ceremony held at Marina Bay Sands. SGBC members were involved in the building projects of 141 out of a total of 247 awards (excluding occupant and overseas schemes). Leading the winners’ list is SGBC member JTC Corporation, who clinched this year’s Green Mark Champion award. JTC Corporation had chalked up 10 Green Mark projects, including 6 Platinum and 3 Gold awards. As for the Green Building Individual Awards, the Green Engineer of the Year was awarded to Mr Russell Neil Cole from Arup Singapore Pte Ltd and the Green Advocate of the Year went to Mr Mann Young from Lend Lease Asia Holdings Pte Ltd. The Young Green Building Individual Award, presented to those aged below 40, went to Dr Kelvin Lee from Samwoh Corporation Pte Ltd and Dr Uma Maheswaran from Jurong Consultants Pte Ltd. Please refer to the media release for more details on the wins of SGBC Members and joint media release with BCA on the BCA-SGBC Green Building Individual Awards. SGBC is pleased to announce the winners of the BCA-SGBC Green Building Individual Awards 2013. The awards are presented by SGBC and the Building and Construction Authority (BCA) to recognise individuals in the building and construction sector for their contribution and achievements in the greening of the built environment. A total of 22 applications were received, with 13 applicants also eligible for the Young Green Building Individual Award, a new category created for those aged below 40. Organized by Carrier, the world leader in high technology heating, airconditioning and refrigeration solutions and a partof UTC Climate, Controls & Security, a unit of United Technologies Corp. (NYSE: UTX); as well as the Singapore Green Building Council (SGBC), the event addressed more than100 building professionals. For more details, please see the PDF. SGBC collaborates with Singapore Business Federation (SBF) to feature SGBC Members and Certified Products in the Singapore Sustainability Directory 2013. The directory will feature a Special Section showcasing and promoting all SGBC Members, as well as companies with SGBC-Certified Products & Services. For more details, please refer to the Application Form and Fact Sheet. To read the interview, please click here. A new Board has been elected for 2013-2015 at Singapore Green Building Council (SGBC), with Mr. Ng Eng Kiong as new President. He is taking over from Mr. Tai Lee Siang, who will serve as the Immediate Past President for the coming two years. For more details, please refer to the press release. Held on a Friday evening, 22 February 2013, the event was well received and was an intellectually stimulating session for over seventy participants. For more details, please see the PDF. The Singapore Green Building Council (SGBC) has launched a new programme for schools - the Green Schools Initiative. The programme aims to equip students and schools with an understanding of the role that buildings play in environmental sustainability, and the impact that building design and technology have on the performance of buildings. Green Schools Initiative is built on the foundation laid by Project Green Insights - SGBC’s recently completed schools project on smarter buildings that was funded by the IBM Centennial Grant. Mr. Gregg Buchbinder shared his unique vision of building a truly sustainable design brand through revolutionary up-cycling initiatives and the continuous quest to achieve zero wastes. For more details, please see the PDF. SGBC and Temasek Polytechnic (TP) have signed a Memorandum of Understanding (MOU) for students from TP’s Diploma in Green Building & Sustainability (GBS) and Integrated Facilities Management (IFM) programmes to embark on a structured internship programme with SGBC and member companies. More than 130 building professionals attended the event, which delivers lectures to educate and inspire green building leaders across the globe. A Founding Member of the SGBC, Carrier has been working closely with the SGBC to achieve their shared vision of a sustainable built environment. For more details, please see the PDF. The event was conducted in two parts, beginning with a seminar session where various speakers shared their perspectives, and concluding with a site tour of CleanTech One towards the end of the seminar. For more details, please see the PDF. SGBC signed an Memorandum of Understanding (MOU) on 25 Oct 2012 with the Vertical Greening Academic Group of China Green Building Council (VGAG), World Green Roof Congress (WGRC) and the Singapore Institute of Landscape Architects (SILA) to support mutual efforts and promotion on urban greenery. The ceremony took place at the World Green Roof Congress 2012 held in Hangzhou, China. SGBC was represented by President, Mr Tai Lee Siang; whilst the Vertical Greening Academic Group of China GBC and World Green Roof Congress were represented by Vice-Group Leader and Secretary-General, Prof Wang Xianmin; and SILA was represented by SILA President, Mr Damian Tang. Animated performances by the contestants impressed the judges Mr Tai and Mr Alan Chan, CEO of Alpha Entertainment, who groomed the latest K-pop Sensation, SKARF. For more details on the Awards, please see the PDF . The team of all Singaporeans - Goh Jia Lin, Ang Mun Ru and Tan Zi Yang - beat other rival finalist teams - two from Temasek Polytechnic and one from Republic Polytechnic to emerge champions in the Quiz. To find out more on the event happening, please visit www.facebook.com/YESbySGBC. During the dinner, SGBC President, Mr Tai Lee Siang, thanked members for the strong show of support for SGBC events, particularly for the International Green Building Conference (IGBC). He also thanked members for their contributions and dedication to SGBC’s outreach effortsand product certification work. A number of awards were given out at the dinner. Sponsors for the IGBC were recognised for their support and financial contributions. Awards were also presented to the top 3 winning schools of Project Green Insight competition, namely: Paya Lebar Methodist Girls School (1st place), Nan Hua High School (2nd Place) and Chong Boon Secondary School (3rd place). The first group of 20 certified companies was also presented with the inaugural Green Services certification, in addition to those certified under SGBC’s Green Product certification scheme. The Green Services certification recipients included Architectural firms, Mechanical & Electrical (M&E) Consultants, and Environmental Sustainability Design (ESD) Consultants. Allin all, SGBC’s efforts in advancing the green building movement in Singapore has been making good progress and the annual dinner was a great way to celebrate successes. For more details, please see the PDF. SGBC hosted the World Green Building Council's Asia Pacific Regional Network Annual Forum 2012 on 11 October 2012 at Sands Expo & Convention Centre, Singapore. Delegates from more than 10 Green Building Councils (GBCs) from around the Asia Pacific region attended the forum. The forum took the form of a roundtable dialogue session where delegates brainstormed on issues that would shape the regional green building movement, led by Ms Jane Henley of the World GBC and facilitated by Network Manager, Mr Mann Young. Issues discussed included development of rating schemes, policy development, data sharing and education programmes for the development of green buildings. GBCs found the session useful to keep updated on one another’s progress and developments. The forum closed with a pledge to continue support for GBCs’ regional green building initiatives. The four finalists for the very first Green Quiz, part of the inaugural Youth for Eco-Sustainability (YES) programme, organised by Singapore Green Building Council (SGBC) have been named. Three of the teams are from Temasek Polytechnic while the remaining team is from Republic Polytechnic. The teams beat 16 other teams who took part in the preliminary round of the competition. The other teams were from various tertiary institutions such as Singapore Polytechnic, Ngee Ann Polytechnic and the National University of Singapore. SGBC celebrated yet another milestone with the signing of a Memorandum of Understanding (MOU) with the Vietnam Green Building Council (VGBC) at the SGBC Pavilion at BEX Asia 2012. The MOU was signed by Mr Tai Lee Siang, President of SGBC and Mr Yannick Millet, Executive Director of VGBC. Guest of Honor, Minister Grace Fu witnessed the signing. Under this latest MOU, both SGBC and VGBC will work towards recognition of the Singapore Green Building Product & Services Certification scheme under the Green Building assessment scheme of Vietnam. The two parties will also collaborate in training, green building development and other services in Vietnam and Singapore. Singapore is making new strides in the green building movement with new schemes for an eco-friendly community and new deals to boost Singapore as the green hub of Asia. Why going green is good for business and the community will be shared by more than 79 industry experts and practitioners to 1,000 participants, and policy-makers from the Asia-Pacific and North America, who are gathered here over the next few days to hear insights from real estate giants, major brands and household names. They are attending the three-day International Green Building Conference (IGBC) 2012, which was officially opened today at the Marina Bay Sands by Ms Grace Fu, Minister, Prime Minister’s Office, Second Minister for the Environment and Water Resources & Second Minister for Foreign Affairs. SGBC is adding a new zing to engage the young in its drive to bring the green message to the community. For the first time, it will be launching its Youth for Eco-Sustainabilty (YES) programme, which will to be held as part of the 4th Annual International Green Building Conference (IGBC 2012) at Sands Expo & Convention Centre, Marina Bay Sands on 12 October 2012. The YES programme, which is in line with this year's IGBC 2012 theme, "Green Community, Green Action", aims to target youths by raising social awareness of green issues that concern young people and educating them to make responsible choices to prepare them for a sustainable future. The Singapore Green Building Council (SGBC) is firing up the country’s drive towards more sustainable buildings with a trio of partnerships and two new green certification schemes. These were announced by Singapore’s Minister for the Environment & Water Resources, Dr Vivian Balakrishnan at the Council’s 4th anniversary dinner on Thursday (12 Sept 2013). Please refer to the PDF for the full media release. A total of 16 exhibitors participated under the SGBC Pavilion at BEX Asia and showcased their latest sustainable products and services. The SGBC Pavilion aimed to be Green in every way, using carpets made of recycled material and also adopting recycled paper in publicity materials. For more details, please see the PDF. New initiatives to engage the business community will be rolled out at the International Green Building Conference (IGBC 2012) to be held from October 10 to 12, 2012 at the Sands Expo and Convention Centre, Marina Bay Sands, Singapore. SGBC, in collaboration with IBM, is working with Ministry of Education to raise students' awareness of energy efficiency and going green in schools. SGBC members won big at the latest BCA awards 2012 held at the Compass Ballroom, Resorts World Sentosa. They garnered a total of 151 out of the total of 315 awards presented- almost half of the total BCA awards given out at the ceremony. Under the first Memorandum of Understanding (MOU) with Green Building Council Indonesia (GBCI), SGBC will work towards recognition of its green building product certification scheme in Indonesia. SGBC has signed a Memorandum Of Understanding (MOU) with China Green Building Council (CGBC中国绿色建筑委员会), its China counterpart in Beijing to collaborate on professional training of green building specialists. This move is a joint effort to promote the "greening" of buildings in China. SGBC will also work towards recognition of its green building product) certification scheme in China within 3 to 5 years. SGBC has joined hands with Singapore Furniture Industries Council (SFIC) to certify "green" furniture products. This initiative, the first green furniture certification in Asia, marks an important milestone for both industry sectors. SGBC members joined BCA in the visit to various organisations in Seoul, Korea to learn more about the policies, initiatives and and programmes to promote green buildings, enhance energy efficiency and reduce greenhouse gases. The delegation visited the Korea Institute of Construction and Technology, Seoul Metropolitan Government, Ministry of Land Transport & Maritime Affairs, SK Chemical Eco Lab and the Songdo International Business District. The itinerary in San Francisco, USA included visits to the California Academy of Sciences, Lawrence Berkeley National Laboratories, California Lighting Technology Centre, UC Davis Energy Efficiency Centre, UC Davis West Village, SF Environment, 101 California, 525 Golden Gate and the California Energy Commission. The US Greenbuild provided the opportunity for SGBC members to network with fellow practitioners and keep abreast of latest green building technologies and developments. SGBC congratulates members who were recognised for their efforts to green the built environment both locally and in projects overseas at the BCA Awards 2014 ceremony. Special mention must be made of SGBC Founding Members, Keppel Land Limited and Nanyang Technological University (NTU)’s leadership role in achieving the BCA Green Mark Champion Award. Keppel Land adopts a proactive approach towards environmental management and protection to create a sustainable future; whilst NTU has been leading in sustainability research and utilising its lush green campus as a living laboratory for sustainability. For a list of Green Mark Award 2014 winners, pls refer to BCA Green Mark. BCA-SGBC Green Building Individual Award winners were also presented with their awards at the BCA Awards 2014 ceremony. The 12 outstanding individuals were recognised for their contribution and achievements in driving sustainability in the built environment and received their awards from Mr Lee Yi Shyan, Senior Minister of State, Ministry of Trade and Industry and Ministry of National Development. Get to know more about our BCA-SGBC Green Building Individual Award winners here. SGBC contributes commentaries and articles on industry trends to enhance awareness and further its cause for the proliferation of green buildings in Singapore. At the same time, SGBC will share with you useful industry news by the relevant authorities and organisations. The latest in green building technologies as well as quality and interior finishings are some of the key features at the 4th edition of BuildTech Yangon, Myanmar’s leading trade exhibition platform serving the fast-growing construction and development sector. Held at the Myanmar Convention Centre from 18 to 20 May, this highly anticipated trade show will bring together 4,000 visitors and 80 exhibiting brands from across the world in an expansive 10,000 sqm space. Organised by Sphere Exhibits, a subsidiary of Singapore Press Holdings (SPH), and co-organised by the Myanmar Construction Entrepreneurs Association (MCEA), leading companies from China, India, Italy, Malaysia, Myanmar, Singapore, South Korea and Thailand will showcase the latest equipment, machinery and solutions in a wide selection of exhibits catering to the construction, machinery, building materials and mechanical engineering segments. According to BMI Research, the Asia construction sector’s growth is expected to hit 5.3% this year, with growth in emerging and frontier South and Southeast Asian markets, supporting the soft demand in China and many developed countries. Increased efforts by governments to encourage private participation in infrastructure projects will also boost the sector, with Myanmar being one of the brightest spots for construction in the world. 2017 will also see the launch of the inaugural Green Building Conference which will bring together keynote speakers and thought leaders such as Tai Lee Siang, Chair of the World Green Building Council as well as subject matter experts from Myanmar and around the world. This year, a special brick laying competition will be introduced to the trade floor. This project is open to construction companies and will showcase a live assembly of a set prototype of a model building. MCEA will also be hosting its annual Gala on the 19 May, where a select group of delegates and luminaries of the construction sector will come together to network and celebrate the achievements of their peers in the 3rd Construction Entrepreneur Awards. The Awards were conceptualised to recognise the best and brightest of construction professionals who have succeeded in raising local standards and skills, and in incorporating the latest construction technologies into the entire ecosystem. Four main awards, namely Best Contractor Awards, Best Project Awards, Individual Awards, Builder of the Year Awards will be jointly awarded by Sphere Exhibits & MCEA. BuildTech Yangon 2017 is supported by the Association of Myanmar Architects, International Facilities Management Association, Singapore Chapter; Italian Chamber of Commerce (Singapore); Green Building Committee, Building Engineers Institute of Myanmar; Myanmar Engineering Council; Myanmar Engineering Society; Myanmar Industries Association; Malaysia Heavy Construction Equipment Owners Association; Master Builders Association Malaysia; Malaysia Timber Council; Singapore Business Federation; Singapore Green Building Council; Singapore Institute of Building Limited; Vietnam Building Ceramic Association; Vietnam Electronic Industries Association; Vietnam Federation of Civil Engineering Association and WSH (Asia). Visitors can pre-register at www.btyangon.com before 9 May to attend the trade show or the Green Building Conference. Delegates attending the conference are entitled to continuing industry development points by the Myanmar Engineering Council. Pan-United Corporation Ltd (“PanU”, “泛联集团” or the “Group”), today announced that its wholly-owned subsidiary, Pan-United Concrete Pte Ltd (“PanU Concrete”), Singapore’s largest concrete supplier, is the first and only local concrete firm to attain the “Leader” 4-ticks certification from the Singapore Green Building Council (“SGBC”). The “Leader” certification was awarded to over 150 specialised concrete products in PanU Concrete’s “Eco” and “Green” ready mixed concrete (“RMC”) ranges – the highest level of sustainability certification in SGBC’s 4-tier classification system. These products were specially developed by PanU’s in-house research & development team at its state-of-the-art Innovation Centre. The concrete products in the “Eco” and “Green” ranges possess a higher content of recycled raw materials, making them more environmentally-friendly and sustainable than regular concrete products. For instance, PanU Concrete’s specially-developed “Self-Compacting Concrete” was used in the foundation raft of the newly-built Tanjong Pagar Centre, which resulted in a 40% reduction in application time, and a 15% decrease in noise pollution, as compared to the application of regular concrete. Ms May Ng (“黄美美"), the Group’s Chief Executive Officer, said: “The “Leader” award confirms the highest standards of sustainability and consistent quality of our concrete offerings. This will give customers even greater confidence in our green product offerings. “Attaining the Leader status sharpens our competitive edge in the national drive for 80% of buildings in Singapore to be green by 2030, as part of the Green Building Masterplan. It will also give us better access to international green building networks and enhance PanU’s standing as a global leader in concrete technologies,” Ms Ng added. Mr Loh also noted that several of the products created in-house, such as “Underwater Concrete”, were developed in partnership with customers, working to address their specific building needs, with the least impact to the surrounding environment and communities. HDB has set up the 'HDB Greenprint Fund' to support and fund the development and implementation of Green Solutions within the precinct. If you have good ideas to achieve savings in water or electricity usage, increase recycling rates, reduce heat in the environment, improve community bonding, and the quality of living our living environment, you may wish to take this opportunity to test-bed your solutions and/or products. The HDB Greenprint Fund will fund and support test-bedding of Smart and Sustainable Solutions and implementations, subject to a cap of S$100,000 per application. The closing date for this grant call has been extended to 28 February 2017. HDB has set up the 'HDB Greenprint Fund' to support and fund the development and implementation of Green Solutions within the precinct. If you have good ideas to achieve savings in water or electricity usage, increase recycling rates, reduce heat in the environment, improve community bonding, and the quality of living our living environment, you may wish to take this opportunity to test-bed your solutions and/or products. The HDB Greenprint Fund will fund and support test-bedding of Smart and Sustainable Solutions and implementations, subject to a cap of S$100,000 per application. a. The closing date for this grant call has been extended to 28 February 2017. 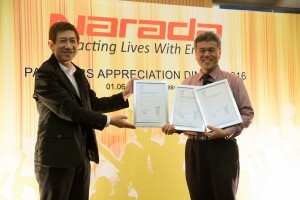 Narada received a Green product certification award with SGBP Rating of “Very Good” for HTB, REXC and ICS series from SGBC Singapore Green Building Council on 1st June 2016 during Narada partner and appreciation dinner. The Singapore Green Building Product (SGBP) labelling scheme is widely recognised for it’s holistic and comprehensive approach towards sustainability criteria, drafted by professionals and experts put together by the Singapore Green Building Council (SGBC) for the industry, by the industry. This grounded methodology enables building products to be impartially evaluated for their relevant, noteworthy qualities, benchmarked against similar products in its category. As a direct result of this emphasis on industrial applicability,the SGBP labelling scheme is recognised under the Building and Construction Authority’s (BCA) Green Mark Scheme, allowing certified products to accrue additional points that count towards a project’s eventual rating. Minister for Finance, Mr Heng Swee Keat, delivered the Budget Statement for the Financial Year (FY 2016) on 24 March 2016. During the Committee of Supply (COS) Debate, the Ministry of Trade and Industry also announced how the Government is supporting businesses during this challenging time and transforming the economy to position ourselves for the future. Budget 2016 seeks to transform the economy through innovation and enterprise, and build a caring and resilient society for all Singaporeans. This will be a collaborative effort by the people, businesses, the community and the government. For businesses, the Government aims to address their near-term challenges, while addressing mid-to long-term needs. Seize opportunities by capitalising on global economic trends that present exciting new opportunities so that we can thrive in a slower growth environment. Create value by moving into deeper value creation anchored on entrepreneurship and innovation to harness future opportunities and compete globally. Boost productivity by pushing ahead with productivity and transformation through restructuring and internationalisation, and upskilling our workers to prepare for jobs of the future. Click here for a summary of the key thrusts and initiatives to support local businesses. Click here for more details on Budget 2016. Since July 2013, building owners have been required to submit building information and energy consumption data relating to their buildings to BCA annually. For 2016, healthcare facilities and tertiary institutions will also be included. For these newly targeted buildings, BCA will serve a written notice to building owners 3 months before the submission date on 1 July, to allow building owners to have sufficient time to prepare the data. The notices will include the unique system generated login ID and password to facilitate the first-time account registration of the building owners. Affected building owners will begin to receive these notices from 1 April. Cree, Inc. records another LED industry first with the demonstration of a single high-power LED delivering nearly 1,600 lumens at 134 lumens-per-watt (LPW) with similar color quality as an incandescent light bulb. With this result, Cree achieved a breakthrough 25 percent increase in lumens per watt (LPW) over production LEDs of similar color quality under operating conditions found in real-world LED lighting applications. This important milestone coupled with Cree’s latest SC5 Technology™ platform will lead to LED systems with increased performance, lower cost and better light. Many of today’s LEDs that provide excellent light quality do so by compromising LED efficacy, resulting in lower system performance or higher system cost. Cree’s latest innovation demonstrates a no-compromise solution that enables high quality light at the lowest cost. As an example of what Cree’s technology could achieve, a current 60W LED replacement lamp with average light quality (3000K CCT & 80 CRI) could be upgraded to incandescent-like light quality (2700K CCT, 90+ CRI & 90+ R9) with the same light output and power consumption levels at no additional cost. The recently approved California Title 20 appliance standard for LED bulbs highlights the importance of this type of performance without cost and energy savings compromises. Cree reports that the R&D LED performance was measured at 1587 lumens at 350 mA and junction temperature of 85°C, delivering 134 LPW with a CRI Ra > 90 and R9 > 90 at 2700 K CCT. GO BEYOND: DESIGN CHALLENGE goes beyond the usual design competition by funding the construction of a working prototype in addition to prize money. This is an international design competition organized by the Singapore-based ONG FOUNDATION for architects, engineers, designers and innovators from around the world to collaborate and create new-to-the-world solutions for our built environment of the future. Rise to the challenge now. Click here or visit gobeyond.ongfoundation.org for more information. Carrier Singapore Pte Ltd. (Carrier Singapore) has launched the Toshiba Super Modular Multi System-e (SMMS-e), a next-generation variable refrigerant flow (VRF) system that combines industry-leading energy efficiency with expanded capacity loads and a smaller modular footprint. Carrier Singapore distributes Toshiba air conditioning products in Singapore as part of a global alliance agreement between the two businesses. Carrier, the world’s leader in high-technology heating, air-conditioning and refrigeration solutions, is a part of UTC Climate, Controls & Security, a unit of United Technologies Corp. (NYSE: UTX). The SMMS-e is the next generation model of the Toshiba VRF system and boasts a number of industry-leading system enhancements, including an expanded single outdoor unit capacity, as well as an expanded combination capacity. Driven by high-volume compressors and Toshiba’s high-performance inverter, the product is now one of the most energy efficient in the industry. The SMMS-e has a single unit outdoor capacity of up to 22HP, which enables building owners to save on the footprint occupied by each system, with a reduced number of combined modular units necessary to obtain a high capacity. An ideal system to support green building development, the SMMS is designed to help meet increased demand for high-efficiency building systems that use less energy and lower the overall carbon footprint of buildings. “We are delighted to distribute yet another innovative Toshiba cooling product that specifically caters to the needs of our customers in the Southeast Asia region,” said Oon Wee Chin, president, UTC Climate, Controls & Security, Southeast Asia. The Building and Construction Authority (BCA) is pleased to announce the Call for Presentations for the International Green Building Conference 2016 (IGBC2016) to be held from 7 - 9 September 2016 at Marina Bay Sands Convention Center, Singapore. Accelerate and advance green building movement international covering all aspects of sustainable design, construction and operations practices for buildings, including their impact on people, environment and businesses. Call for presentations for IGBC 2016 closes on 18 March 2016. For more information, visit http://www.sgbw.com.sg/en/call-presentations. As the world begins to embark on the global agreement successfully ratified at the Conference of Parties 21 in Paris, France last December, both developed and developing countries have specific targets for contributing to the collective global action of reducing emissions of greenhouse gases by 2030. Singapore is no exception, and the island state will have to make provisions for the Paris Agreement over the next 15 years. Although Singapore has been fairly regular in terms of its emissions targets, with its Intended Nationally Determined Contribution (INDC) for 2030 submitted before the Paris talks, Singapore must be prepared to further lower its annual emissions to 65 million tonnes by 2020. SGBC and its member companies, with practicable knowledge and sound expertise on sustainability practices, are well positioned to help Singapore to achieve more in a lesser time. Energy efficiency has always been on the cards for Singapore’s sustainability targets, with the Building and Construction Authority (BCA) Green Mark Scheme putting emphasis on a building’s energy efficiency and the Energy Conservation Act requiring energy intensive companies to register with the National Environment Agency (NEA) and implement mandatory energy management practices. Other areas such as the necessitating of stricter green building codes can go towards helping Singapore reach its emissions reduction targets. Usage of solar photovoltaic (PV) systems has been part of Singapore’s emissions reduction strategy, but irregular output due to cloud formations may damage electrical systems if PV is used on a wide scale. However, when the related technology improves, so will Singapore’s use of PV systems to bolster energy efficiency, a significant player in Singapore’s emissions goals. All these point squarely at the elevation of green buildings as a whole. The opportunity for green building and energy efficiency expertise is clear and apparent, with multiple avenues for professionals and practitioners to contribute to Singapore’s sustainability ambitions. On 28 January 2016, the 21 economics of the Asia Pacific Economic Cooperation (APEC) released details of tariff reductions to 54 environmentally friendly products, bolstering trade as well as strengthening the fight against climate change. The first multilateral reduction in 20 years, this initiative will at once help to lower prices of environmentally friendly products such as solar panels and wind turbines, it will also help the region to poise itself to meet its targets of doubling renewable energy generation by 2030 while reducing energy intensity by 45% by 2035. The tariff cuts will also boost trade amounting to about USD300 billion regionally and USD500 billion annually. The progress of implementation and next steps will be discussed during the next APEC Meeting in Lima on 20 February to 4 March 2016. City Developments Limited (CDL) has been crowned the world’s most sustainable real estate company, as well as coming in at 10th place in this year’s Global 100 Most Sustainable Corporations of the World index, published by media and investment advisory firm Corporate Knights. Released during the World Economic Forum on 21 January 2016 in Davos Switzerland, this year’s Index notes a significant increase in Asian firms making it to the list since its inception in 2005. • 64th place: Johnson Controls Inc.
Click here to check out the full list of the Global 100 most sustainable corporations in the world. World Wide Fund for Nature’s (WWF) Earth Hour takes on its biggest challenge ever in 2015 by focusing on the world's most stubborn environmental challenge – climate change. The ninth edition of Earth Hour will roll across the globe at 8.30pm local time on Saturday, 28 March 2015. This year, Singapore’s iconic ION Orchard will descend into darkness for an hour in participation of Earth Hour 2015. For more details of Award, please click Here. SGBC congratulates 9 of our members who have made it to the 2015 Global 100 Most Sustainable Corporations list. Local real estate firms, namely City Developments Limited, CapitaLand and Keppel Land, have once again made it to the list, demonstrating their commitment to sustainability. In addition, Singapore became the first in Asia to reach the top 10 for global corporate sustainability this year, with Keppel Land coming in at the 4th position. For more information, please visit 2015 Global 100 Results. The Responsible Business Forum on Sustainable Development, a high-level congregation of government, business and civil society leaders focused on the theme of “Building Prosperity with Economic, Social and Natural Capital”, will take place from 24-26 November 2014 at Marina Bay Sands in Singapore. Co-organised by Global Initiatives, Eco-Business, Nanyang Technological University (NTU), WWF (World Wide Fund for Nature) Singapore, together with strategic partner Marina Bay Sands, the Responsible Business Forum on Sustainable Development will provide practical solutions for sustainable growth. High-level working groups across six sectors – building & urban infrastructure; consumer goods;financial services; food, beverage and agriculture; renewable energy and shipping – will produce actionable recommendations for building a more prosperous society and planet. This is especially critical in Asia, where rapid economic development is creating greater social inequality and environmental crises such as the trans-boundary haze in Southeast Asia and widespread pollution in India and China. SGBC is an Event Partner for Responsible Business Forum 2014, and members are entitled to promotional rate. For more information, please see PDF. ECOSPEC Global Technology Pte Ltd has been crowned the Green Technology Awards Winner during the Singapore Sustainability Awards 2014, an annual accolade organised by the Singapore Business Federation (SBF) to showcase the most innovative and impactful sustainable practices and green solutions amongst organisations. Take for example the ECOSPEC BacComber cooling tower water treatment system, a certified product under the Singapore Green Building Council’s (SGBC) Singapore Green Building Product (SGBP) certification scheme. An original ECOSPEC green invention, the use of Ultra Low Frequency waves to treat water from cooling towers eliminates the use of harmful chemicals and helps in the conservation of natural resources through the recycling of cooling water, resulting in substantial energy savings. SGBC congratulates ECOSPEC for their achievements in the Singapore Sustainability Awards 2014! The Building and Construction Authority (BCA) has released the Application Guidelines and Forms for the new incentive scheme, GMIS-EBP. The GMIS-EBP aims to encourage building owners and tenants to undertake Energy Improvement Works involving the installation of energy efficient equipment approved by BCA to achieve substantial improvements in energy efficiency. It provides a cash incentive amounting to up to 50% the Qualifying Costs incurred solely for the purposes of energy efficiency improvements in existing buildings and premises. The incentive applies to Small & Medium Enterprise (SME) tenants and building owners, or building owners with at least 30% of its tenants who are SMEs. The scheme will take immediate effect. For information about the circular, please visit BCA website or click Here for the circular. The 2015 FuturArc Prize (Launched in 2008) is the first International Green Building Design competition in Asia open to professionals and students. The 2015 FuturArc Green Leadership Award (Launched in 2009) recognises the team behind a completed project: the developer, consultants and contractors, who have collectively pushed the limits and definition of What a Green building is in Asia Pacific. For more details of FuturicArc Prize 2015, please click Here. For more details of FuturicArc Green Leadership Award, please click Here. It’s the biggest and best opportunity for us to shine the spotlight on the global green building movement and our collective mission – to create sustainable built environments. Together with over 100 other Green Buildings Councils around the world, we create a more connected and interactive conversation around the role buildings play in creating our sustainable future. Pomeroy Studio, award­‐winning designers and thought leaders of sustainable built environments, opened their curated exposition Design Green! Skycourts & Skygardens on September 1st. The 3­‐week event at the National Design Centre (NDC) consists of 3 integrated components: ‘The Exhibition’, ‘The Discussion’, and ‘The Installation’. Held in conjunction with the Singapore Green Building Week 2014 and supported by the DesignSingapore Council, the exhibition and related events are conceived to celebrate the incorporation of greenery and open spaces within buildings for social interaction. Te Mirumiru, a bilingual child care center in New Zealand, was presented with the Leadership in Sustainable Design and Performance trophy. Three companies were recognized in the Business Leadership in Sustainability category: Singapore’s City Developments Limited and Keppel Land Limited, and India’s ITC Limited–Hotels Division. Minister Lim Hng Kiang, Second Minister S Iswaran, SMS Lee Yi Shyan and MOS Teo Ser Luck, delivered their Committee of Supply speeches for the Financial Year (FY) 2014 on 6 March 2014. MTI painted its vision of a new economic landscape, and shared plans to pursue quality growth, with emphasis on the need to stay the course to restructure and raise productivity. Outlining the key areas covered in the speeches in a simple, easy-to-read format, please view the MTI COS infographics here. You may access the speeches by Minister Lim, Second Minister Iswaran, SMS Lee and MOS Teo, as well as the fact sheets on the respective key initiatives here. Feedback on the 2014 Committee of Supply Debate can be sent to to=mti_email@mti.gov.sg&;su=Feedback%20on%20the%202014%20Committee%20of%20Supply%20Debate" target="_blank" style="color: rgb(60, 159, 0); text-decoration: none;">mti_email@mti.gov.sg. World Green Building Council (WorldGBC) has launched global project that aims to define the health and productivity benefits of green office buildings. The topic is rising up the global release estate sector’s agenda as organizations begin to understand the business benefits of greener, healthier buildings. With 85 per cent of a company’s costs spent on salaries and benefits, even modest improvements to staff health and productivity can have a dramatic impact on organizational profitability. For more information, please visit WorldGBC and read about Bruce Kerswill's New Year message here. For more information, please visit Global 100. KNX is the worldwide only open STANDARD for Home and Building Control. KNX complies with the requirements of the international standard (ISO/IEC 14543-3) as well as with both European standards (CENELEC EN50090 and CEN EN13321-1 respectively EN13321-2) and the US ANSI/ASHRAE. The approval of KNX as Chinese Standard (GB/T 20965) confirms the importance of the KNX technology on the Asian continent. The high interest in China for compatible KNX products and the KNX Technology has encouraged KNX Association to have the international ISO/IEC approved Standard 14543 - 3 translated into Chinese. The translated KNX Standard was fed into the Chinese standardization process via the standardization body SAC TC124 and approved by this committee as GB/T 20965, making KNX the only approved standard for Home and Building Control in China. For press release, please view PDF. The Building and Construction Authority (BCA) of Singapore has received the International Star (I-Star) for Energy Efficiency award for its commitment to achieve a national target of greening at least 80 per cent of all buildings in Singapore by 2030 and for its achievements thus far. BCA is the first government agency outside of America and Europe to be honoured with this prestigious award, given out by the Alliance to Save Energy (ASE), a non-profit US-based energy efficiency coalition that promotes energy efficiency worldwide through research, education and advocacy. FuturArc Prize, now entering its 7th year, is a design ideas competition open to students and professionals. FuturArc Green Leadership Award, now in its 5th year, recognises built projects for which the project teams are recognised. Both competitions offer a platform for innovative ideas on Asia's sustainable future. For more competition details and submission dates, please view PDF. SGBC Member CapitaLand has been awarded the 2013 Environmental Tracking (ET) Carbon Ranking Leader Award – Asia Pacific 300. CapitaLand’s achievement was as a result of it being ranked 8th in the Asia Pacific region for its disclosure of greenhouse gas emissions and transparency. The rankings are produced each year by the Environmental Investment Organisation (EIO), an independent not-for-profit research body based in the United Kingdom. The Environmental Tracking Carbon Ranking series is the only public database of its kind and evaluates companies based on their market size, irrespective of green credentials. A total of 300 of the largest companies across the Asia-Pacific region were included in the study. Congratulations to SGBC Member CapitaLand Limited! For more information, please view press release by Environmental Investment Organisation. ITE College Central boasts the largest vertical greenery installation at a single development in the world. Approximately 5,300 sq m (57,000 sq ft) of living walls, reaching a height of 35 m (115 ft), adorn the façade of the campus blocks, and form a substantive part of its overall green design. For more details, please refer to the write up. From 1 July 2013, building owners will be required to submit building information and energy consumption data relating to their buildings to the Building and Construction Authority (“BCA”) annually. This requirement comes under “Section 22FJ – Power to Obtain Energy Consumption and other Information” of the Building Control Act (Chapter 29). A copy of Section 22FJ is provided in the press release, Annex 1 below. BCA will be using the data to monitor energy efficiency of buildings in Singapore and formulate the national energy benchmark. The benchmarking data will be made available publicly so that building owners can pro-actively improve their buildings’ energy performance. For more details, please refer to the press release on BESS, and press release on Green Mark Legislation (10 Sep 2012). For more details, please refer to the bulletin. The Ernst & Young EOY awards program was launched in Singapore in 2002 to honour entrepreneurs who have created and sustained successful business ventures, as well as to coincide with the government’s focus on fostering entrepreneurship and grooming local entrepreneurs. Candidates were assessed on six global criteria: entrepreneurial spirit, financial performance, strategic direction, global impact, innovation and personal integrity or influence. Mr. John Lim of ARA will also be representing Singapore at the annual Ernst & Young World Entrepreneur Of The Year (WEOY) to be held in Monte Carlo, Monaco in June 2013, and will compete with more than 50 other country winners for the world title. Congratulations to our SGBC Members! For more information, please visit Ernst & Young EOY. The new Green Mark for Data Centres was launched today by Ms Grace Fu, Minister in Prime Minister's Office and Second Minister for Environment and Water Resources and Foreign Affairs at the opening of the International Green Building Conference and BEX Asia, which are anchor events of the Singapore Green Building Week. The new dedicated green building rating system for data centres is jointly developed by Building and Construction Authority (BCA) and the Infocomm Development Authority (IDA). For more details, please refer to the media release. Singapore, which is a small island city-state, is very vulnerable to the consequences of climate change. It is also particularly concerned with the need to use resources efficiently, especially energy and water. Because of this and as part of the global community, Singapore has been doing its part to reduce the overall carbon footprint. As part of this effort, the national target to “green” at least 80% of all buildings in Singapore by 2030 was set in 2009. Championed by the Building and Construction Authority (BCA), the green building movement has come a long way since it was started in 2005. Public sector buildings took the lead to go green to be certified under the Green Mark scheme. Read more to find out on how Singapore is going green in building sustainability. The 2013 FuturArc Prize (Launched in 2008) is the first International Green Building Design competition in Asia open to professionals and students. The 2013 FuturArc Green Leadership Award( Launched in 2009) recognises the team behind a completed project: the developer, consultants and contractors, who have collectively pushed the limits and definition of What a Green building is in Asia Pacific. For more details of FuturicArc Prize 2013, please click on http://www.futurarc.com/prize2013/. For more details of FuturicArc Green Leadership Award, please click on http://www.futurarc.com/greenleadershipaward2013/. For more details, please refer to the newsletter. The 10th World Green Roof Conference will be held in Hangzhou, China this year from 22nd Oct to 27th Oct. This conference is a public platform for elites from Vertical Planting industry and other industries to share their concern for global environmental protection, sharing new technologies, exchanging contacts , sharing on policies of ecological environmental protection and to promote the development of Green Roof Industry across the globe. We would like to invite you to attend this conference. As part of Singapore’s efforts to promote environmental sustainability, a target to improve energy efficiency by 35% from 2005 levels by 2030 was set by the Government. In line with this, the Building and Construction Authority (BCA) aims for at least 80% of the buildings in Singapore to be more resource-efficient, and achieve at least a Green Mark Certified rating by 2030. To complement the on-going efforts, R&D will be one of the key enablers to help achieve greater resource efficiency in buildings. Eco-friendly workplaces in Singapore have happier and productive employees when they perceive their companies as environmentally responsible. Studies after studies have shown this to be true. So instead of simply constructing green buildings, practising sustainability in offices should be a continuously evolving process. Read more to find out on the benefits of green offices. Going green has been given greater impetus if the latest developments concerning Singapore's construction industry are an indication. The first salvo came earlier this month when BG (NS) Tan Chuan Jin, Minister of State, (National Development & Manpower), said the Building and Construction Authority (BCA) has been tasked to bring forth a number of initiatives and incentive schemes for firms to tap the "green wagon" as part of the bold steps to reshape the construction industry and enhance its overall image. Read more to find out the impacts of green on the industry.